VATICAN CITY (CNS) -- A deadly militant siege of a Catholic cathedral in Baghdad, Iraq, was a "savage" act of "absurd violence," Pope Benedict XVI said. The pope urged international and national authorities and all people of good will to work together to end the "heinous episodes of violence that continue to ravage the people of the Middle East." "In a very grave attack on the Syrian Catholic cathedral of Baghdad, dozens of people were killed and injured, among them two priests and a group of faithful gathered for Sunday Mass," the pope said of the Oct. 31 incident. "I pray for the victims of this absurd violence, which is even more savage because it struck defenseless people, gathered in God's house, which is a house of love and reconciliation," he said after praying the Angelus with pilgrims in St. Peter's Square Nov. 1, the feast of All Saints. He expressed his closeness to Iraqi Christians, who have suffered another attack in their homeland, and he encouraged the nation's priests and lay faithful "to be strong and steady in hope." Pope Benedict renewed his urgent call for peace in the Middle East. While peace may be a gift of God, "it is also the result of efforts by people of good will and national and international institutions," he said. "May everyone unite their efforts so as to end all violence," he said. Armed militants wearing explosives stormed the cathedral Oct. 31 while an estimated 100 faithful were celebrating evening Mass, news reports said. The terrorists first set off a car bomb across the street in front of the Baghdad Stock Exchange, which left at least two people dead. Then they stormed the church, killing another two people, according to reports. The militants, who said they were part of the Islamic State of Iraq -- a group with suspected ties to al-Qaida -- held parishioners and priests hostage in the hopes of leveraging the release of prisoners from their network. The terrorists demanded prisoners linked to al-Qaida be set free from detention in Iraq and Egypt and they threatened to blow up the church if military forces attempted to break the siege, according to Italian state media RAI. 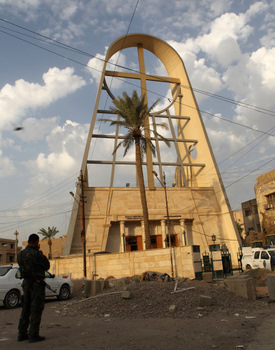 Iraqi security forces ringed the church and U.S. military flew overhead in helicopters. After a standoff that lasted hours, Iraqi forces stormed the cathedral and the ensuing firefight and a series of explosions left a large number of people dead and injured. The Associated Press reported Nov. 1 that at least 39 people were killed, which included hostages, Iraqi security forces and suspected militants. Other agencies were reporting 52 people dead and 56 people wounded. 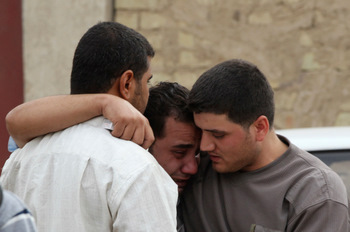 One report said Iraqi church sources included three young priests among those dead. Syrian Catholic Patriarch Ignace Joseph III Younan was in Canada when the blasts occurred. In an e-mail to Catholic News Service Nov. 1 while he was en route to Baghdad, he criticized the lack of security for Christian places of worship and called on "Iraqi parties to overcome their personal and confessional interests and look for the good of the Iraqi people who have elected them." "There are a few churches and Christian institutions left in Baghdad, not so great a number that it is not unreasonable for them to be protected, security-wise," he said, noting that the security being provided by the government is "far less than what we have hoped for and requested." "Christians are slaughtered in Iraq, in their homes and churches, and the so-called 'free' world is watching in complete indifference, interested only in responding in a way that is politically correct and economically opportune, but in reality is hypocritical," said the patriarch, who served as bishop of the New Jersey-based Syrian-rite diocese in the United States and Canada from 1995 until his election as patriarch in 2009. The patriarch demanded "that the U.S. Congress, the United Nations, the International Commission for Civil Rights and the League of Arabic States" condemn the actions at the church and "take the appropriate action to defend innocent Christians brutally singled out because of their religion, in Iraq and some other Middle Eastern countries." 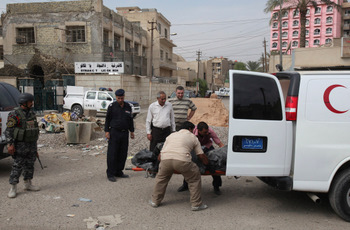 Chaldean Auxiliary Bishop Shlemon Warduni of Baghdad told Vatican Radio Oct. 31 that at least one child was killed in the incident. During the siege, he asked people to pray that God would give the hostage-takers the grace to take into consideration the women, children and all the innocent who were threatened by their actions. Vatican spokesman Jesuit Father Federico Lombardi told reporters at the time of the siege that "it's a very sad situation, which confirms the difficult situation in which Christians live in the country." "Christians live with great insecurity and we express our solidarity with them," he said. Iraqi bishops had just participated in a special Synod of Bishops Oct. 10-24 with the pope at the Vatican; the synod drew attention to the challenges facing Christians in the Middle East. During the synod, Iraqi bishops said kidnappings for ransom, bombings of churches and other Christian buildings and a general lack of security have made life so precarious for the vulnerable Christian community that about half have left their homeland for safer destinations in the past seven years. The cathedral and four other churches were the target of a string of bombings Aug. 1, 2004, when parishioners were leaving Sunday Mass; 15 people were killed in those attacks.